On Thursday morning, the official McDonald's Corporate Twitter account tweeted out the following sharply-worded criticism of President Donald Trump. The company quickly deleted the tweet, and blamed it on hackers. But by that point, the damage was done. Everyone on the internet had screenshots of the tweet, and it was already going viral. 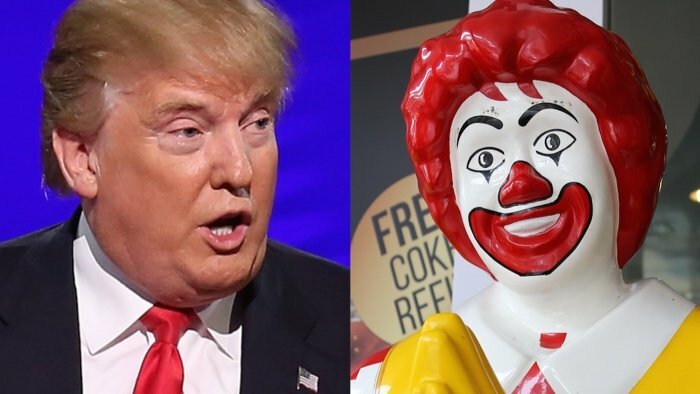 Donald vs. Ronald: The Battle for America's Hearts. And because they love nothing more than piling on President Trump, comedians on Twitter immediately started cracking jokes about it. Here are the funniest ones we could find. 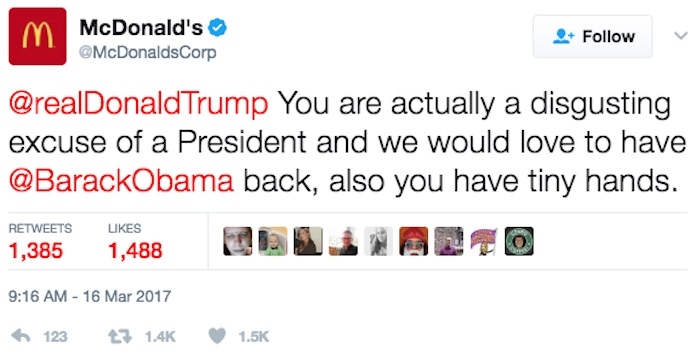 McDonald's calls Trump "a disgusting excuse of a President" on Twitter. This must be a confusing time for Chris Christie. Aide: We killed Meals on Wheels. Real talk? @McDonalds is just mad 'cause @RealDonaldTrump stole Grimace's body shape. Hey @McDonalds, wanna take over Meals on Wheels? Thank you for apologizing, @McDonalds! For the sake of our country, we need @realDonaldTrump to keep pounding those meaty Big Macs. Maybe Obama hacked into McDonald's Twitter through one of their microwaves. Not saying you should, but if everybody ate at @McDonalds today you'd create a intriguing incentive for future social media campagns. Funny that someone at McDonald's has gone rogue but I stand by my thing that "Trump has tiny hands" is bottom 10 least funny jokes ever. Before you discredit @McDonalds right to come after @realDonaldTrump, remember that POTUS and Ronald did go to clown college together. Sure, Trump has already alienated the scientific community, people of color, LGBT Americans, the CIA, almost every other country, and the media. But beef with McDonald's? This is where America draws the line.